Click the button below to add the Series 5 Electric Violin by Don Rickert Design to your wish list. Click on the image or link below to see a slide show of this truly innovative electric violin. THIS INSTRUMENT IS AVAILABLE NOW! NOTE: This is one of several instruments designed by Dr. Don Rickert (a custom version, of course) that will be used for the Active Acoustics (a new kind of synthesizer) project directed by Dr. Dan Overholt (inventor of the Overtone Violin) at Auberg University at Copenhagen and Stanford University. 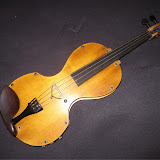 The Series 5 Electric Violin by Don Rickert Design is a hybrid between a "skeletal" electric violin, such as the Yamaha Silent Violin series but also with a full top and back plate. The violin combines ancient design elements with an “industrial” look. The curvy top is formed old spruce rather than carved. The Rickert Series 5 Electric Violin has an optional completely adjustable neck angle and an adjustable damping mechanism (optional as well). Owing to its open physical structure, the Series 5 works with almost any combination of pickups and pre-amps imaginable. The purpose of this option is to allow the player to quickly change the height of the strings over the fingerboard (the action) without having to remove the neck, as one has to do with the Series 4 Electric Violin. Contrary to popular belief, acoustic properties matter a lot with electric violins. Why do you think that there is such a variety of materials and body shapes for electric violins? When NOT plugged in, the un-damped sonority and power of this instrument is audible with a pleasing timbre, making it an excellent "unplugged" practice instrument…similar to the excellent PrakticeViolins made by Lawrence Earlbaum. With the damper fully engaged, it is still a wonderful practice instrument, but very quiet! The cool thing is, and every player who has ever used an electric violin for practice, is that the bow response is like a fine acoustic instrument. Using the damper in the Series 5 Electric Violin when “plugged in”, one can achieve a timbre ranging from "electrified" acoustic violin to a solid body instrument, or something in-between, such as the high-end skeletal-body electric violins (e.g. the professional performance level Yamaha “Silent” models). Trust us, we have been working on damper designs for over 5 years and we are happy with the result, as will you be! A typical pickup configuration would use a bridge transducer (either attached to the bridge or the entire bridge itself with some multi-transducer pickups) in conjunction with an under the bridge or soundboard transducer. Both pickups are wired to a dual-input “onboard” (i.e. inside the instrument) pre-amp. The pre-amp not only allows you to balance the effect of each pickup, but also strengthens the signal from each pickup. The right pre-amp makes all the difference between a thin cheap electric violin sound and an output with beautiful timbre and power. Electric Violins by Don Rickert Design are sold in a manner analogous to buying a Dell Computer. You buy the basic unit and then specify the options necessary to make it a functional computer that meets your needs. There are a number of options and accessories requiring specification, but it is NOT that difficult. Dr. Don Rickert, who has owned over a dozen electric instruments by other makers and has designed and built about 40 instruments will walk you through the process personally. The cost will typically be about twice the base price. The cost, of course, is much more than that if you decide on pickups costing the same as the basic instrument, for instance. For example, a Barbera pickup with a Schertler preamp is about $1,000…but you do not need these unless you have very unusual professional performance requirements. All accessories are sold as separate items. Generally, you will have consulted with us first. If you do not choose any accessories or you choose accessories that do not make sense to us, we will contact you to discuss your choices. In all cases we will send you an invoice that includes the cost of all accessories before authorizing a charge on your credit card. Chin Rest: Because the Series 5 is more or less shaped like a violin, you can use any chin rest you wish. We recommend the New International Violin Adjustable Height Chin Rest or a Wittner polycarbonate side or center-mounted rest. Shoulder Rest: As with chin rests, you can use any shoulder rest that clips onto the “overhang” that you want. Specialty shoulder rests, such as foam and inflatable do not work so well, as the back of the instrument is flat rather than arched. Tailpiece: For electric violins we ONLY recommend either a Wittner polycarbonate (a VERY hard plastic) or a Thomastik-Infeld metal tailpiece. Both come in 4 and 5 string versions. Unless specified otherwise, we will install a Wittner stainless steel tail hanger…the stainless steel gives more sustain than the nylon type. External Pre-amp: For stage performers, an external preamp with active gain and equalization controls is usually a requirement. Such an external preamp can be either belt-mounted or be on the floor (with foot controls). We can supply either type.